Typically in my Django projects deployments I use Nginx as a front-end web server to handle static content while proxying all other requests to Apache. When the request arrives to Apache, the client IP address is 127.0.0.1. We need to configure Apache to accept the IP address from X-Real-IP or X-Forwarded-For headers set by Nginx. To solve this problem I use mod_rpaf that does exactly the opposite of mod_proxy_add_forward. This also applies if your are using a different webserver as front-end such as Lighttpd or another instance of Apache. I've created a Python User Group in Portugal. The idea is to join people who enjoy programming in Python. No membership is required to participate, experienced programmers and absolute beginners are both welcome! You can visit the site or follow us on Twitter. 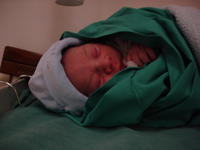 Rafael Barbosa Mariz was born at 00h48, July 26, 2008. He weighed 3.580 Kg and was 50 cm long. Rafael and Marta are doing well. Finally we have a Django 1.0 roadmap and timeline. Jacob Kaplan-Moss posted today on Django devolopers. I must say this roadmap seems very realistic and the only thing that I will miss is the aggregation support, that is promised to be released in a future version, maybe in 1.1. My goal was to archive and display my internet lifestream. My first approach was writing a client for each API of the social networks that I'm in. This turned out to be a complete waste of time and effort. All that I needed after all was a FriendFeed account that would centralize all my feeds. Archiving and displaying your entries with Django is quite simple. As you can see, I've used a generic view. You can also use the date based generic views and pagination to build an archive like mine. See my lifestream as the working example. Thanks to Chris Kelly that send me an email reporting this. Django has a code error notifications mechanism when a view raises an exception. It will email the people in ADMIN tuple(settings documentation) in settings.py with the full exception information and displays the default 500.html template. This only happens when DEBUG=False in the settings.py. It's possible to set a handle that change this behavior with a handler500 variable in the root urls.py. So, we can easily write a simple view that sends an error notification to our jabber account. NOTE: Don't forget to set DEBUG=False in the settings.py. A simple templatetag for adding to the template context a variable with the user timeline from Twitter. It uses the CachedContextUpdatingNode snippet for caching from Jacob Kaplan-Moss. The reason that is necessary to cache content is because Twitter limits the number of accesses to the API. This only works if the cache is enabled on your settings.py. raise TemplateSyntaxError, "twitter_user_timeline tag takes exactly three arguments"
raise TemplateSyntaxError, "second argument to twitter_user_timeline tag must be 'as'"